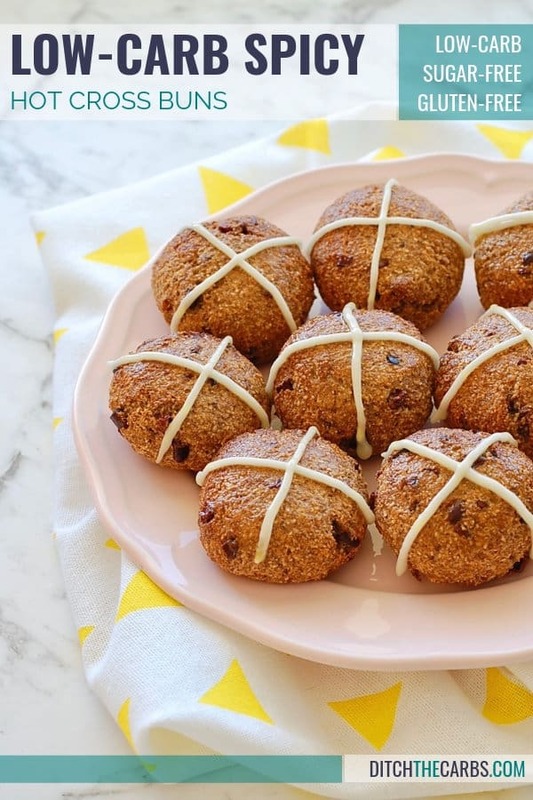 Low-carb hot cross buns are the holy grail at Easter, in fact, any time of year these little spicey buns are great to make. But read on, because mine has a special ingredient that your kids will LOVE. 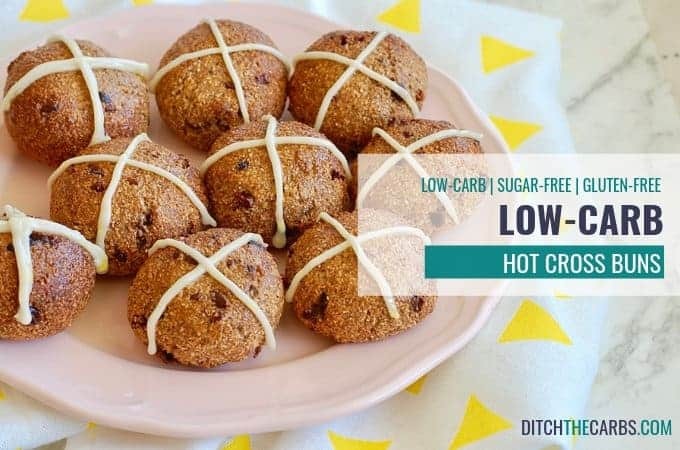 Last week when I posted my Paleo Easter Eggs, someone asked if I had a recipe for a low-carb hot cross bun. I’ve managed to quickly adapt my focaccia recipe into a low carb hot cross bun. 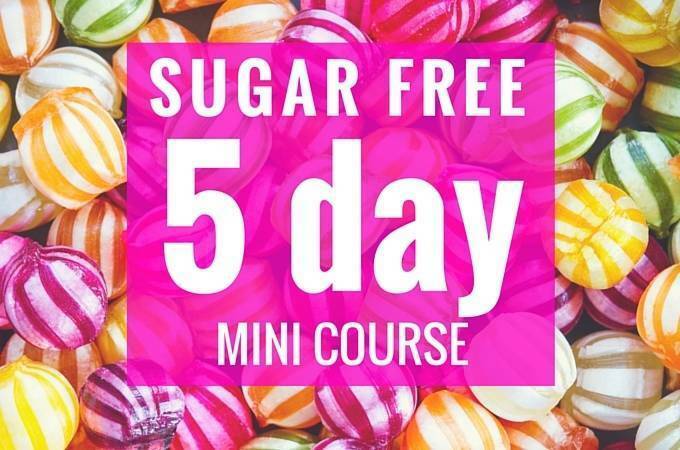 You can choose if you want to add raisins or chocolate chips, but these will add to the sugars and carbs. 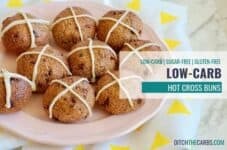 These low carb hot cross buns are dairy free, nut free, gluten free, grain free and paleo. I don’t usually make low carb versions of bread because I no longer enjoy the taste and texture of bread, but it’s all about choice. To get a better crumb for the hot cross bun, I would have preferred to use ground almonds (almond meal), but so many people are requesting a nut free bread. For a more ‘cake’ like texture (psyllium husks can make these a little on the stodgy side), I would go to my lemon coconut cake and substitute the lemon for another egg and the spices in the recipe below. All my recipes are pretty adaptable. It really depends on how close you want to get to the real hot cross bun taste and how low carb you want to go. These healthy hot cross buns taste even better when warmed and served with lashings of butter (note: they would no longer be dairy free). I personally love them toasted, but considering we threw away our toaster 3 years ago, I have to pop them in the oven or dry fry them. But what’s my secret ingredient? Cacao nibs to give the hot cross buns a bit of crunch and a little hidden chocolate hit inside. Genius! If you want to see what’s in my pantry, take a look at the Top 20 Low-Carb Pantry Essentials. And if you are new here, this page will give you all the resources you need. I have never heard of or seen “mixed spice”…..what could I use instead? If you are in the States, you may know this as Pumpkin Spice. I also have linked the mixed spice to Amazon. You can buy it here. I’ve made a savory version, skipping the sweetener and the spices. I’ve used a muffin tin with some parchment paper, so I get six of them, and I tried different flavors: two plain, one with nutritional yeast, one with sesame seed on top, one with walnuts inside and the last one with sunflower seeds inside (one Tbsp of each). They were sooo good! All of them. And so easy! This is going to be my go to recipe for buns. Thank you very much indeed! Is the psyllium husks whole or powder ? I’ve used three brands of this stuff finely ground in England and everything comes out a shade of purple, which I really can’t offer to visotors as it’s not very appetising to me to be eating purple or lilac-coloured bread and it’s all becoming a bit of an expensive hobby. What make of this stuff can I buy, or you use as your.obviously promoting it to.be used, that does not go purple when baked? I.even brought back a fourth fro Ireland but can’t face using it to end up as I expect a total disappointment. .
Hi Tim, I used whole and it worked perfectly! Hi can I use this recipe if I want to make a lchf fruit loaf? What would be the cooking time? Gosh, that would have so many variables. How big is your loaf tin? How tall? How long? How deep would that make the batter? I would begin by cooking it for 20 minutes then gauge how much longer by how far it has cooked already. Sorry, I can’t give you precise instructions as there are so many things that affect cooking times. Love this recipe – and the Focaccia recipe – I make both a lot! One question – if they rise nicely when baking and then collapse when taken out of the oven – what do you think that means? Too much baking powder? Too much liquid? Any tips would be fab! It sounds like perhaps you need to bake them for a little longer to crisp up the crust so they don’t collapse. Alternatively you could reduce the liquid, but I’d hate for you to have tough dry bread instead 🙁 Has anyone else had this problem with some handy tips for Karen? I know right? It makes me laugh when people say how restrictive it is, man, we live like KINGS!!!! After making a very successful first batch, I decided to tweak this recipe a little to add almond meal as I wasn’t entirely happy with texture of just coconut flour. Changes were simple, worked great first time! Woohoo! I make 12 balls and bake for 35mins in fan oven. Love em. Yummmmmmmmm – this is fabulous! Thank you for taking the time to post your adapted recipe – love it. I tried your tweaked recipe – turned out fab. Thank you! Tried this today, but something went wrong as the dough was very soft I could not make the rolls. I baked one whole loaf . I could not roll into 8 equal balls …could not roll it at all as it was soft. I wonder if I should add more coconut flour or any other kind of flour ? Or even more coconut flour ? Both psyllium and coconut are affected by moisture in the air and moisture in the bag (linked to how long the bag has been opened). So sometimes you may need to adjust the recipe by adding a small amount of water (if too dry) or more coconut flour or psyllium (if too damp), as in this recipe. Well done to think laterally and make a loaf. That would actually be a lovely, toasted, with butter (of course). I have made so many of your recipes with great success but the hot cross buns were a disaster. Very dark, stodgy, didn’t swell up at all. I must be doing something wrong here! I use psyllium husk powder. Is this right? Goes dark purple when cooked. Should I just be using husks? Did I need less water? HELP! I want these to succeed as everyone else seems to be very successful. Thanks for all the other good recipes I use. Happy Easter! I have heard from a few readers that their psyllium husk does purple when baked, it is a reaction between the baking soda/powder and the husks. Some brands turn purple more than others, so try another brand next time. Mine have never gone purple, I would love to see that. As for them being dense, perhaps more water was needed to make them swell? A super easy recipe to try, is the cinnamon Chelsea buns/rolls using psyllium husk. I have made this numerous times and they work a treat. Hi Libby. Thank you for your advice. I will order some husks instead of powder and see what happens! I really want to master this if possible – and I will have a go at the Chelsea buns. The colour I could live with but the glutenous effect was just too much lol. They made better balls but the dog enjoyed some of them with no ill effects! These are all the most popular brands used in a low-carb pantry. What is the brand you use? Dave me wasting another bag as it’s not cheap.in England. All my baking has come out purple. It’s disgusting-looking! I am in NZ so y brands probably aren’t available for you. I just use the regular supermarket brand, nothing fancy. I even buy it from the bulk bins too. Hi we don’t get psyllium husk or cacao nibs in south Africa.is there a substitute? Sorry not for this recipe, it makes up such a large part of the recipe. I have heard of others in SA cooking with psyllium husk. Maybe buy it online? Of course we get psyllium husk in SA! All Dischems stock it. Where do you live? There’s defo psyllium husk in SA. I have heaps. And raw cacao nibs can be found at health shops but they’re pricey! So good! Didn’t bother with the icing. Mine didn’t need to cook as long. Maybe because I used convect bake? I made these a week or so ago and am making them again tomorrow morning. Yummy!! This is my new obsession. The texture is incredible! I leave the sweetener on top out and also in the bread itself and it is still lovely. Next I want to leave the spices out and see if I can serve them as dinner rolls. Thank you so much for the recipe. I made them for the first time and they came out beautiful. Light, airy and delicious. So far all your recipes came out perfect and taste awesome. Thank you. Yum yum yum, that would be a scrumptious change. Thanks for the suggestion. Just lookes at the recipe for the lemon cake as I would like to use almond meal for the hotcross buns. Do I just replace the amount for 100 gr almond meal and leave all the other ingredients out and just use the recipe as above? Am getting a bit confused….. I would use all the ingredients in the lemon cake, just swap the lemons for the spices above and add an extra egg to make up for the missing lemon juice. Do you use psyllium husk powder or whole? It’s just called psyllium husks here. This is similar to the Psyllium Husk I buy. Some call it whole psyllium husk. Flaky little fibres. You mentioned using ground almonds for a better crumb so I’m thinking of trying that. Would you just do a straight swap between the almonds and the coconut flour, and everything else remains the same? No you can’t so s straight swap of almonds for coconut flour as they have totally different properties. I would look at my lemon coconut cake and replace all the lemon flavours for the spices here. It would turn into more of a cake than a bread. Hiya, i’m just making these now… i’m up to 25 mins now, as cut one at 15, and 20 and was still soft in the middle… i’m not much of a baker but my oven normally cooks to recipe pretty well… do you suggest upping the temperature or just giving them more time….. I would do a bit of both. So maybe increase the temperature a bit and cook for a little longer. I will add a comment on the recipe with your suggestions. Thanks. Yes I’m sure they will. They would also be nice toasted with butter once defrosted. Hi Libby, how much is 30g psyllium husks in tablespoons or teaspoons? My kitchen scale seems to be playing up… Thanks! What is your recipe for the “Icing”. This looks great by the way, I’m excited to try it! In the ingredients panel it shows just stevia icing mix and a little bit of water to make a paste. If you don’t have stevia icing mix, you could melt some chocolate (in fact you could add some cocoa to the bun mix 🙂 ). 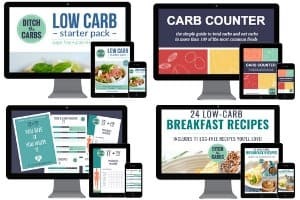 Your recipes all look and sound great! I’d be trying every one of them–and I will once I kick these food intolerances. Just want you to know I read them all, even if I don’t comment. Does the dough need to sit for a while before making it into buns? Nope! it can just go straight in the oven. Thank you Libby, I was the one who asked for the Hot Cross Bun recipe. 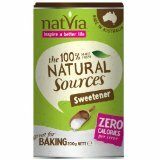 Just another question – where will I find the stevia icing mix? Not in this recipe sorry as it is such a large part. Why not try my lemon coconut cake and remove the lemons and small amount of psyllium, but add these spices to turn it into a hot cross cupcake?